ReBirth is relatively simple to use, especially if you have got to know the hardware Roland synths in the past, and although previously commercial software, it has been generously released as freeware by its developers, Propellerheads. 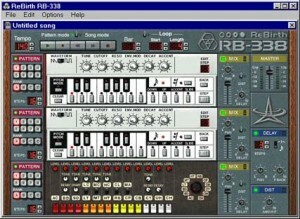 Although there are various software VST plugin synths available today, this brings three great synths together. If you are after creating growling dance basslines and synthlines then Rebirth is well suited to you. Installation is not quite as simple as other options as this is the full software ISO which first needs to be burnt to a CD and then istalled from there, but once this is done (and there are instructions included in the download) then it is very easy to get started. it may have been a genuine link in the past, but appears to be a total fake link now. when you click the “win download” link button it only ever takes you to a internet connection spoeed test.